Congratulations to Imaginary Forces on their Outstanding Main Title Design Emmy win for Manhattan! 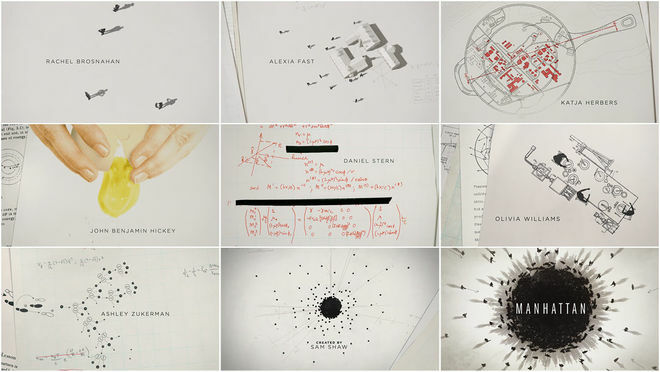 The diagrammatic opening titles featuring music by Jonsí and Alex are the first Emmy main titles win for cable channel WGN. 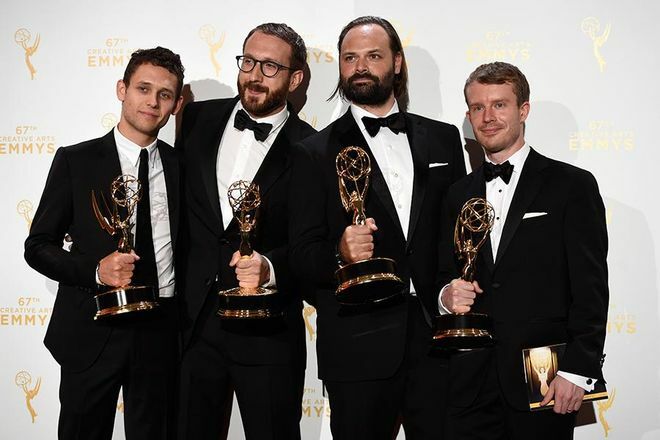 Imaginary Forces has previously received the Emmy in Outstanding Main Title Design for their work on shows Mad Men and Masterpiece Theatre: The American Collection, as well as nominations for Magic City, Boardwalk Empire, Human Target, Nurse Jackie, The Pacific, and Rubicon. Griffin Frazen, Dan Gregoras, Jon Hassell, and Jeremy Cox of Imaginary Forces backstage at the 2015 Creative Arts Emmy Awards. The 2015 Emmy nominations for Outstanding Main Title Design were announced in July, with some clear favourites as well as a few surprises. All of the studios nominated for their work are heavyweights of the industry, with at least a decade of title design for major networks and series under their belts. 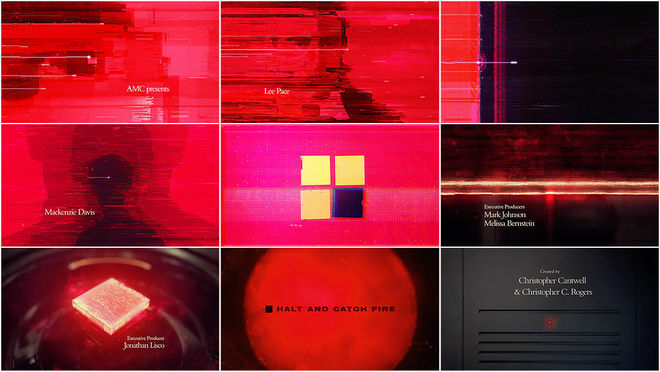 With nominations for their work on Halt and Catch Fire and Marvel's Daredevil, production studio Elastic continues to be a force to be reckoned with in title design. Imaginary Forces also earned double nods (Bosch and Manhattan), and yU+co racked up another nomination for their work on Olive Kitteridge. Prologue received its third nomination for their main titles to American Horror Story, with the latest incarnation, Freak Show, following in the footsteps of its creepy predecessors. If you’re wondering about Elastic’s True Detective season two titles, its absence is due to timing. Like Halt and Catch Fire last year, it narrowly missed the cutoff date for the Emmys, which this year honors the best in U.S. prime time TV programming released between June 1, 2014 and May 31, 2015. On the network side, streaming services like Amazon and Netflix continue to make inroads at the Emmys, and the Outstanding Main Title Design category was no exception this year. Title sequences from these non-traditional services are up for the Title Design prize for the first time ever. Although cable networks like HBO, AMC, and FX continue to be mainstays of the category, their dominance may soon be coming to an end. The real surprises this year were Bosch and Olive Kitteridge, which seemed to fly under the radar up until this point. Like any award show there were also a number of notable snubs, including Man Seeking Woman (Digital Kitchen), The Affair (TCG), Marco Polo (The Mill), and BoJack Horseman (Mike Roberts), which remain definitively among our favourites of the past year. 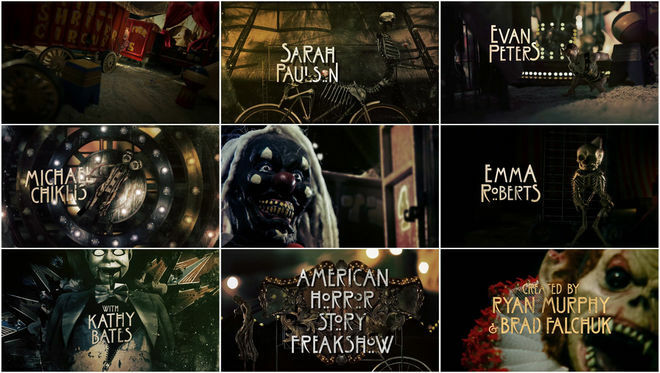 The fourth in a long and creepy line of main title sequences, the opener for American Horror Story: Freak Show is also quite possibly the best. A freakishly functional marriage of stop-motion and CGI, the sequence continues the series’ play with body horror and disfigurement, this time twisting up the tropes with a trip to the big top. The cast of characters includes a three-legged woman, worn old masks, two-headed critters, conjoined skeletons, and clowns (so many clowns), all shambling to the carnival-infused theme by sound designer Cesar Davila-Irizarry and musician Charlie Clouser (formerly of Nine Inch Nails). The sequence is a terrifically evocative opener and a fun romp for veteran fans of the horror genre. It’s also what you’d imagine Tim Burton and Kyle Cooper might dream up if they had a sleepover party and played dolls. A cop, a serial killer, and a fast-paced world of opposites. 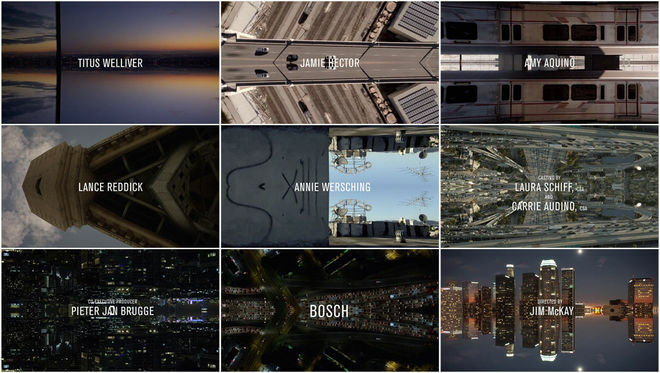 This is Imaginary Forces’ funky, mesmerizing opener for Bosch, an LA-set police procedural where there’s always more than one side to the story, no matter who’s telling it. Electro-soul outfit Caught A Ghost’s title track “Can't Let Go” evokes images of detectives, smoke-filled dive bars, and moonlit mysteries – classic film noir stuff – but the slick visuals of the Bosch titles are completely at odds with those ideas. IF uses a deceptively simple mirroring effect, picking up the threads that Danny Yount laid down in his symmetry-focused opening titles to Semi-Permanent Portland 2013. Where Yount’s sequence opened up the scene, providing a breath of fresh air, IF’s closes it in, cuts it off at the middle. This binding of image and reflection gives the endless sprawl of Los Angeles a claustrophobic feeling, as if the skyline is some city-sized maw opening wide to swallow you whole. Nighttime roads become caverns bathed in halogen light, buildings become interlocking fingers of metal and glass. It’s a beastly yet alluring vision of the city, a refined chaos, revealing the town’s true colours while sparing viewers those tired detective story tropes. Read our in-depth discussion with Director Patrick Clair and Lead Animator Raoul Marks. The diagrammatic titles for the WGN America wartime drama Manhattan draw a picture of daily life for the men and women involved in one of history’s greatest R&D projects: the atomic bomb. Designed by Imaginary Forces, the sequence brings new meaning to the term “nuclear family,” cleverly juxtaposing the humdrum realities of suburban living with the theoretical physics and hard math that ushered in the Atomic Age. Read our in-depth discussion with Creative Director Dan Gregoras, Art Director Jeremy Cox, and Producer Jon Hassell from Imaginary Forces. 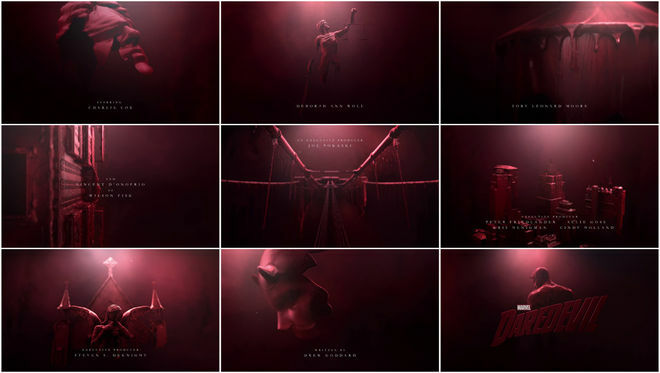 Elastic’s main titles for Daredevil – Marvel’s hardboiled foray into the world of episodic on-demand television – announce the series in grand fashion. Viewers are introduced to the violent, murky New York City that blind lawyer slash masked vigilante Matt Murdock calls home. An insidious, corrupting force is set upon the world, seeping out into the city, blood red, trickling down from the highest towers like hot wax, drowning the streets below. It’s there that a figure emerges – the Devil of Hell’s Kitchen – shaped by the city, formed by all that fear and ill intent – a part of it but compelled to oppose it. Echoing the sloshing Chianti of Hannibal’s all-too-brief main titles and the raging black ooze of The Girl with the Dragon Tattoo, Daredevil’s blood-soaked opener serves as memorable calling card for the series. Head bowed, horns out, a great weight washing over his shoulders. Good, bad, or something in between, this place makes you what you are. Read our in-depth discussion with Creative Director Patrick Clair, Illustrator/Designer Yi-Jen Liu, CG Lead Andrew Romatz, and Fluids Lead Miguel A. Salek. To quote American designer Charles Eames: “The details are not the details.” It’s just so in the leisurely opening to Olive Kitteridge, HBO’s 4-part miniseries about a woman unravelling in a picture-perfect small town tucked away in New England. 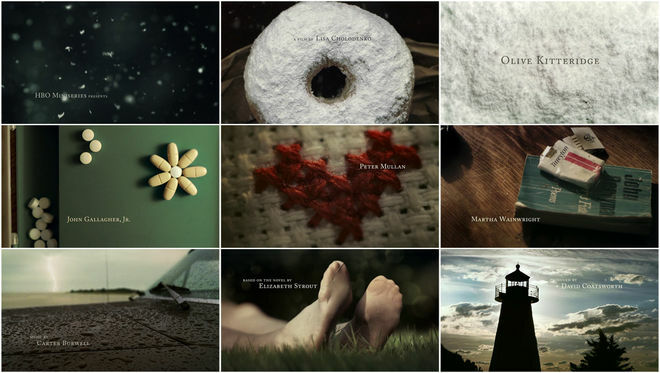 This impressionistic sequence takes its time, following in the footsteps of title sequences to shows like Six Feet Under and Dexter, allowing the items and small rituals on display to tell their stories with grace and stoic aplomb. What first appears to be snow, falling starkly against a dark background to melancholy music by composer Carter Burwell, is confectioner’s sugar on a doughnut – the sweet delightfully mixed in with the sour. Then follow pills in the shape of a flower, an embroidered heart leaking, the stain from a drink peering out from itself, stockinged feet in the garden, a landscape becoming wallpaper. The audience is invited to continuously ask: Who is Olive, among these small things? Read our in-depth discussion with Art Director Synderela Peng. Tune in to the 67th Primetime Creative Arts Emmy Awards on September 12th to find out which sequence takes home the prize. 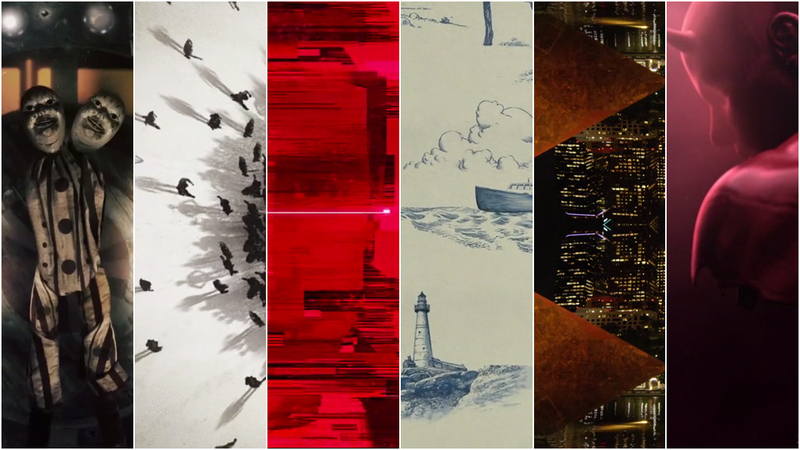 And in the meantime, be sure to read our Top 10 Title Sequences of 2014 feature to see more of the best title design work of the last year.